You are cordially invited to our annual Art-Open-House at Europa Inn! this Saturday, December 5th, 2015. 9am-3pm! Natasha Tessmann who just moved to town a few months ago: she is sewing the cutest one-of-a-kind stuffies along with kitchen-witches and some painted art. All her works are whimsy, bright and cheery. I am encouraging her to open an online store as I have never seen anything like her works. She makes everything from scratch, even the little faces, fingers and accessories! She is fun to talk to and very positive as a person, I think anyone stopping in will enjoy meeting her! Another artist I am proud to introduce is local pastel artist Helen Stevenson. Helen has worked exclusively in pastel for a few years now and her work is quite exquisite. Her colour sense is refined and she has been painting almost daily for many months now. 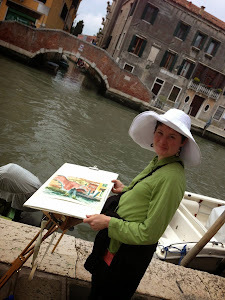 It is mostly local land- and seascapes that she features, but she takes her pastels with her on her travels. She works often in small format. Helen had doubts to be ready for the show, but I am sure she will be a wonderful addition to our set of artists! Come check her works- you will be amazed!If you are interested in woodworks, I am excited to have Colin Green's petit woodworks available. His darling wife Jessi will be at the booth answering your questions and selling. From small jars with lids, bowls to spoons and tree ornaments, there is something for everyone to discover. As every year, I am pleased to have Joe Hunt from Mascarene Woodworks offer his high quality and sought after wooden bowls with us. One local artist, Mabel Ketchum, a St. Andrews household name who has been designing many of the 'St. Andrews Trade Dollars' has just picked up the paintbrush again this year and been busy creating a most wonderful series of fun, whimsy, encouraging women paintings and cards. There is a total of 21 different images available- the perfect way to send a smile to that special friend! I have seen some, but not all and am really looking forward to her exhibiting. If you love teddies and fabric works, check out Barbie Smith's display. Her second year with us, she is a great addition and brings insight and expertise to anyone interested in collecting, giving or looking-to-give a personalized teddy to a child or adult. Everything is handmade, too, bear AND accessories. You will see classic to hip, and get a smile and good conversation from this local, retired high school teacher. St. George, Mascarene landscape artist Anne Hill will be exhibiting with us this year, too. Check out her bright, whimsy landscape works: using three colours- one brush method that both Barbara Neilson and I are using, too, she is a student also of Chinkok Tan who comes every summer to St. Andrews to teach his method. Barbara Neilson, who many of you know will have a new array of greeting cards available along with her super large size watercolour paintings. For jewellery and sewn gifts we are proud to have back with us lamp bead artist from Deer Island Lynne Bowland who's exquisite craftsmanship has a loyal following, local and aboard; she sells on Etsy, too and I'm a big fan of her works! Bertha Day from right here in St. Andrews will have an enticing dispay at our Art-Open-House of fabric and yarn wearable art. Earrings, one-of-a-kind travel scarfs, cards, brooches bangle bracelets and many more- most are easy-to-mail and the perfect pick-me-up gift or stocking stuffer. She is always very busy selling and talking to interested customers. One more Deer Island artist- did I say yet that Deer Island is a VERY creative place??? Award winning surrealist and landscape artist Jerome Andrews has his very own unique style that he's been developing with a productiveness and relentless work ethic that not many artists have like him. His dear wife, Jenny shared with me that he walks over to his ocean front studio every day, working hours on pieces, developing characters that are a cross between fantasy and surreal storytelling. Truly a one-of-a-kind we are proud to have share his works with you! Thanks for the plug... I'll have to see if I have one of those bracelets in the gallery to bring tomorrow!